BlackBerry today posted a $4.4bn dollar loss for Q3 and announced that it is moving some of its manufacturing operations to Foxconn. From these dire figures it's clear that new CEO John Chen has his work cut out securing the future of this once-mighty Canadian giant. Waterloo, ON – BlackBerry Limited (NASDAQ: BBRY; TSX: BB), a global leader in wireless innovation, today reported financial results for the three months ended November 30, 2013 (all figures in U.S. dollars and U.S. GAAP, except where otherwise indicated). Revenue for the third quarter of fiscal 2014 was approximately $1.2 billion, down $380 million or 24% from approximately $1.6 billion in the previous quarter and down 56% from $2.7 billion in the same quarter of fiscal 2013. The revenue breakdown for the quarter was approximately 40% for hardware, 53% for services and 7% for software and other revenue. During the third quarter, the Company recognized hardware revenue on approximately 1.9 million BlackBerry smartphones compared to approximately 3.7 million BlackBerry smartphones in the previous quarter. Most of the units recognized were BlackBerry 7 devices. During the quarter, approximately 4.3 million BlackBerry smartphones were sold through to end customers, which included shipments made and recognized prior to the third quarter and which reduced the Company’s inventory in channel. Of the BlackBerry smartphones sold through to end customers in the third quarter, approximately 3.2 million were BlackBerry 7 devices. GAAP loss from continuing operations for the quarter was $4.4 billion, or $8.37 per share diluted. The loss includes a non-cash, pre-tax charge against long-lived assets of approximately $2.7 billion (the “LLA Impairment Charge”), a primarily non-cash, pre-tax charge against inventory and supply commitments of approximately $1.6 billion (the “Q3 14 Inventory Charge”), and pre-tax restructuring, legal and financial advisory charges of approximately $266 million related to the Cost Optimization and Resource Efficiency (“CORE”) program and the strategic review process. This compares with a GAAP loss from continuing operations of $965 million, or $1.84 per share diluted in the prior quarter, and GAAP income from continuing operations of $14 million, or $0.03 per share diluted, in the same quarter last year. Adjusted loss from continuing operations for the third quarter was $354 million, or $0.67 per share diluted. Adjusted loss from continuing operations and adjusted diluted loss per share exclude the impact of the LLA Impairment Charge of approximately $2.7 billion ($2.5 billion after tax), the Q3 14 Inventory Charge of approximately $1.6 billion ($1.3 billion after tax) and pre-tax restructuring and legal and financial advisory charges of approximately $266 million ($225 million after tax) related to the CORE program and strategic review process incurred in the third quarter of fiscal 2014. These impacts on GAAP loss from continuing operations and diluted loss per share from continuing operations are summarized in the table below. The total of cash, cash equivalents, short-term and long-term investments was $3.2 billion as of November 30, 2013, compared to $2.6 billion at the end of the previous quarter. Cash flow used in operations in the third quarter was approximately $77 million. Cash flows provided by financing activities in the third quarter were approximately $991 million, including the proceeds from the issuance of debt. Uses of cash included intangible asset additions of approximately $234 million and capital expenditures of approximately $46 million. Purchase obligations and commitments amounted to approximately $2.1 billion as at November 30, 2013, with purchase orders with contract manufacturers representing approximately $664 million of the total. The Company announced today that it has entered into a five-year strategic partnership with Foxconn, the world’s largest manufacturer of electronic products and components. Under this new relationship, Foxconn will jointly develop and manufacture certain new BlackBerry devices and manage the inventory associated with those devices. The initial focus of the partnership will be a smartphone for Indonesia and other fast-growing markets targeting early 2014. BlackBerry will own all of its intellectual property and perform product assurance on devices through the Foxconn partnership, as it does currently with all third-party manufacturers. BlackBerry will focus heavily, via internal development, on market segments where its continuous innovations in secure hardware, software and services remain critical and integral to enterprise and government customers. BlackBerry also intends to drive adoption of its multi-platform BBM, deliver real-time, reliable and secure messaging through its Network Operations Center (NOC), and grow its enterprise mobility and mobile device management business through on-premise and cloud-based solutions for cross-platform devices as well as its own. In the fourth quarter, the Company anticipates maintaining its strong cash position and further reducing operating expenses as it continues to implement its previously-announced cost reduction program. Note: Adjusted gross margin, adjusted gross margin percentage, adjusted loss from continuing operations before tax, adjusted loss from continuing operations and adjusted diluted loss per share from continuing operations do not have a standardized meaning prescribed by GAAP and thus are not comparable to similarly titled measures presented by other issuers. The Company believes that the presentation of these non-GAAP measures enables the Company and its shareholders to better assess the Company’s operating results relative to its operating results in prior periods and improves the comparability of the information presented. Investors should consider these non-GAAP measures in the context of the Company’s GAAP results. (1) During the third quarter of fiscal 2014, the Company reported GAAP gross margin of $(1.3) billion or (106%) of revenue. Excluding the impact of the Q3 14 Inventory Charge and CORE charges included in cost of sales, the adjusted gross margin was $404 million, or 34%. (2) As part of the Company’s ongoing effort to streamline its operations and increase efficiency, the Company commenced the CORE program in March 2012. Further, the Company announced the formation of a special committee to conduct an organizational strategic review on August 12, 2013. During the third quarter of fiscal 2014, the Company incurred charges related to the CORE program and strategic review process of approximately $266 million pre-tax, or $225 million after tax. Substantially all of the pre-tax charges are related to one-time employee termination benefits, facilities and manufacturing costs related to the CORE program and legal and financial advisory costs related to the strategic review process. During the third quarter of fiscal 2014, charges of approximately $76 million were included in cost of sales, charges of approximately $37 million were included in research and development and charges of approximately $153 million were included in selling, marketing, and administration expenses. (3) During the third quarter of fiscal 2014 the Company performed a long-lived asset impairment test and based on the results of that test, the Company recorded a non-cash LLA Impairment Charge of approximately $2.7 billion pre-tax, or $2.5 billion after tax. (4) During the third quarter of fiscal 2014, the Company recorded a primarily non-cash, pre-tax charge against inventory and supply commitments of approximately $1.6 billion, or $1.3 billion after tax, which is primarily attributable to BlackBerry 10 devices. A conference call and live webcast will be held beginning at 8 am ET, which can be accessed by dialing 1-800-814-4859 or through your BlackBerry® 10 smartphone, personal computer or BlackBerry® PlayBook™ tablet at http://ca.blackberry.com/company/investors/events.html. A replay of the conference call will also be available at approximately 10 am by dialing (+1)416-640-1917 and entering pass code 4612570# or by clicking the link above on your BlackBerry® 10 smartphone, personal computer or BlackBerry® PlayBook™ tablet. This replay will be available until midnight ET January 3, 2014. A global leader in wireless innovation, BlackBerry® revolutionized the mobile industry when it was introduced in 1999. Today, BlackBerry aims to inspire the success of our millions of customers around the world by continuously pushing the boundaries of mobile experiences. Founded in 1984 and based in Waterloo, Ontario, BlackBerry operates offices in North America, Europe, Asia Pacific and Latin America. BlackBerry is listed on the NASDAQ Stock Market (NASDAQ: BBRY) and the Toronto Stock Exchange (TSX: BB). For more information, visit www.blackberry.com. “focused”, “getting”, “opportunities”, “we are seeing”, “continuing”, “drive”, “improve”, “should”, “will”, “increasing”, “anticipated”, and similar terms and phrases are intended to identify these forward-looking statements. Forward-looking statements are based on estimates and assumptions made by BlackBerry in light of its experience and its perception of historical trends, current conditions and expected future developments, as well as other factors that BlackBerry believes are appropriate in the circumstances, including but not limited to BlackBerry’s expectations regarding its business, strategy, opportunities and prospects, including its ability to implement meaningful changes to address its business challenges, the launch of products based on the BlackBerry 10 platform, general economic conditions, product pricing levels and competitive intensity, supply constraints, and BlackBerry’s expectations regarding the cash flow generation of its business and the sufficiency of its financial resources. Many factors could cause BlackBerry’s actual results, performance or achievements to differ materially from those expressed or implied by the forward-looking statements, including, without limitation: risks related to BlackBerry’s ability to implement and realize the benefits of its strategic initiatives, including a return to its core strength of enterprise and security, changes to the Devices Business, including the new partnership with Foxconn, and the transition to an operating unit organizational structure consisting of Enterprise Services, Messaging, QNX Embedded Business and the Devices Business; the risk that uncertainty relating to BlackBerry’s recently completed strategic review process, operational restructuring, recent management changes and workforce reductions may adversely impact BlackBerry’s business, existing and future relationships with business partners and end customers of its products and services, and its ability to attract and retain key employees; BlackBerry’s ability to maintain existing enterprise customer relationship and to transition such customers to the BES10 platform and deploy BlackBerry 10 smartphones, and the risk that current BES10 test installations may not convert to commercial installations; risks related to BlackBerry’s ability to implement and to realize the benefits of its operational restructuring initiatives, including its CORE program, and its ability to continue to realize cost reductions in the future, including the on-going efforts to reduce operating expenditures by 50% and to continue to implement a workforce reduction of approximately 4,500 positions by the end of the first quarter of fiscal 2015; BlackBerry’s ability to adapt to, and realize the anticipated benefit of, recent management changes; risks related to BlackBerry’s ability to offset or mitigate the impact of the decline in its service access fees on its consolidated revenue by developing an integrated services and software offering; BlackBerry’s ability to enhance its current products and services, or develop new products and services in a timely manner or at competitive prices, including risks related to new product introductions; intense competition, rapid change and significant strategic alliances within BlackBerry’s industry; BlackBerry’s increasing reliance on third-party manufacturers for certain products and its ability to manage its production and repair process, and risks related to BlackBerry changing manufacturers or reducing the number of manufacturers or suppliers it uses; BlackBerry’s ability to maintain its existing relationships with its carrier partners and distributors; BlackBerry’s ability to maintain or increase its liquidity, its existing cash balance, to access existing or potential alternative sources of funding and the sufficiency of its financial resources; BlackBerry’s ability to manage inventory and asset risk and the potential for additional charges related to its inventory; potential charges relating to the impairment of intangible assets recorded on BlackBerry’s balance sheet; BlackBerry’s ability to successfully maintain and enhance its brand; risks associated with BlackBerry’s foreign operations, including risks related to recent political and economic developments in Venezuela and the impact of foreign currency restrictions; risks relating to network disruptions and other business interruptions, including costs, potential liabilities, lost revenues and reputational damage associated with service interruptions; risks related to litigation, including litigation claims arising from BlackBerry’s practice of providing forward-looking guidance; security risks; risks related to intellectual property rights; BlackBerry’s ability to expand and manage BlackBerry® World™; reliance on strategic alliances with third-party network infrastructure developers, software platform vendors and service platform vendors; risks related to the collection, storage, transmission, use and disclosure of confidential and personal information; BlackBerry’s reliance on suppliers of functional components for its products and risks relating to its supply chain; BlackBerry’s ability to obtain rights to use software or components supplied by third parties; risks related to government regulations, including regulations relating to encryption technology; BlackBerry’s reliance on third-party manufacturers; potential defects and vulnerabilities in BlackBerry’s products; risks as a result of actions of activist shareholders; government regulation of wireless spectrum and radio frequencies; risks related to economic and geopolitical conditions; risks associated with acquisitions; foreign exchange risks; and difficulties in forecasting BlackBerry’s financial results given the rapid technological changes, evolving industry standards, intense competition and short product life cycles that characterize the wireless communications industry. These risk factors and others relating to BlackBerry are discussed in greater detail in the “Risk Factors” section of BlackBerry’s Annual Information Form, which is included in its Annual Report on Form 40-F and the “Cautionary Note Regarding Forward-Looking Statements” section of BlackBerry’s MD&A (copies of which filings may be obtained at www.sedar.com or www.sec.gov). These factors should be considered carefully, and readers should not place undue reliance on BlackBerry’s forward-looking statements. BlackBerry has no intention and undertakes no obligation to update or revise any forward-looking statements, whether as a result of new information, future events or otherwise, except as required by law. The BlackBerry family of related marks, images and symbols are the exclusive properties and trademarks of BlackBerry Limited. RIM, Research In Motion and BlackBerry are registered with the U.S. Patent and Trademark Office and may be pending or registered in other countries. All other brands, product names, Company names, trademarks and service marks are the properties of their respective owners. Amazon's next-generation of Kindle Fire devices aim to take an even bigger share of the Android tablet market with a revised version of the Kindle Fire HD and two new higher-resolution devices, the 7-inch and 8.9-inch Kindle Fire HDX. The "X" in "HDX" indicates that this pushes beyond the boundary of plain old HD, and the high-quality display in these puts most other Android tablets firmly in the shade and the HDX range represent a potent threat to the newly-refreshed Google Nexus 7. In terms of raw hardware specification, the Kindle Fire HDX (with both 7-inch and 8.9-inch models) definitely steal the thunder from most of their rivals with a blazingly fast quad-core Snapdragon 800 processor clocked a 2.2GHz (Qualcomm's fasted to date), which Amazon says makes the these new devices three times faster than previous models. Both tablets also have very sharp displays, with the 7-inch Kindle Fire HDX coming in as 323 ppi (pixels per inch) and the 8.9-inch with 339ppi, a significant leap up from the 254ppi of last year's model. Inside, a hefty 2GB of RAM should give the HDX enough memory to cope with demanding applications. 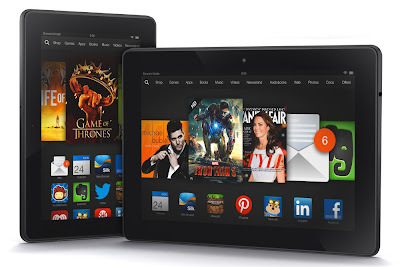 Physically the Kindle Fire HDX 8.9-inch version is the lightest "large-screen tablet" on the market. Compared to last year's devices it is 34% lighter at 345 grams. It's a much more angular and "edgy" design than last year's more curved HD model, and in our opinion it is a pretty imposing black slab of a device. One unusual addition to the Kindle Fire HDX is a "Mayday" feature that brings up live technical support from Amazon if you are having a problem. It seems like a great idea, but it also has the possibility of being the worst tech support job in the entire world. Tablets such as the Kindle Fire don't have the epic battery life of the basic Kindle eBook readers, but even so the Fire HDX can give up to 11 hours of mixed use and 17 hours of reading time. And if you are one of the large crowd of people who inexplicably like to take photos with your tablet, you will be please to know the Kindle Fire HDX 8.9 has an 8 megapixel camera on the back. LTE is also supported if your carrier has it in your area. The new Kindle Fire HD is an upgraded version of last year’s model. This capable slate is powered by a 1.5 GHz dual-core processor – that’s a slight bump from 1GHz speed from last year. Most of the specs are slightly similar to what we have twelve months ago. However, the Fire HD is certainly looking like a bargain tablet at the moment, and if offers very good value for money. Although the Kindle Fire range uses Android underneath, Amazon have heavily customized it and named if the Fire OS 3.0 or "Mojito". Amazon says that there are "hundreds of new and upgraded features", including an improved app-switcher, web browser, carousel replacement and a number of other Amazon-only features and services. Basic models for Fire HDX are priced at $229 for the 7-inch and $379 for the bigger 8.9-inch variant. On the other hand, the Kindle Fire HD is priced at just $139. Amazon will ship these new slates from mid-November to December this year, and prices will vary somewhat depending on which international market you are in. HDX Display – Amazon pushes Fire HDX display higher than HD at 323 ppi (7-inch) and 339 ppi (8.9-inch) pixel densities. 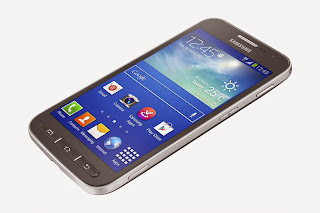 Seoul, Korea - [December 16, 2013] - Samsung Electronics Co., Ltd. today introduced Galaxy Core Advance, combining the powerful Galaxy device user experience with enhanced features. This innovative device provides a meaningful design to extend Samsung’s powerful technology to more users. Galaxy Core Advance provides users with a premium design, sporting a large 4.7” display and a Soft Feel coated back cover that increases durability providing a warm, soft touch to the user and making it easier and more comfortable to grip. The device also incorporates physical keys for frequently used features into its intuitive design. Dedicated keys for voice recorder, camera, volume, menu, home and power functions brings users who are less comfortable with a touch-screen experience seamless access to Galaxy Core Advance’s capabilities. Matched with its ergonomic design, Galaxy Core Advance provides a deep, connected experience with updated Bluetooth 4.0, GPS with GLONASS for improved location accuracy and NFC with S Beam so users can share information such as YouTube videos, contact details and audio files with just a tap. Galaxy Core Advance delivers a range of smart features, including S Voice, S Translator, Sound & Shot, Group Play and Easy Mode, so that users can enjoy the same unique benefits provided by other Galaxy series. To extend the Galaxy experience to more users Galaxy Core Advance also provides convenient usability functions and enhanced accessibility features for disabled and visually impaired users. Key usability and accessibility features include Optical Scan that automatically recognizes text from an image and reads it aloud to the user, Light Sensing technology that uses the device’s camera to sense light direction and brightness, and Instant Voice Recorder that offers simplified access to make quick voice notes. The device is also equipped with Screen Curtain that enables users to operate commands on a black screen to ensure privacy and saves battery life, high quality TTS (Text-to-Speech) functionalities and Voice Guided Camera functions to help users take pictures by reading out the number of faces detected and their standing location. Galaxy Core Advance will be offered in Deep Blue and Pearl White, and commercially available in early next year. A range of dedicated accessories that enhance Galaxy Core Advance’s capability also be available separately soon. ＊User memory space may be less than the total memory space due to system files. User memory may differ by region, carrier, and supporting language, and may change after software upgrade. ＊ The availability of each service may differ by country. ＊All functionality, features, specifications, and other product information provided in this document including, but not limited to, the benefits, design, pricing, components, performance, availability, and capabilities of the product are subject to change without notice or obligation. Samsung Electronics Co., Ltd. is a global leader in technology, opening new possibilities for people everywhere. Through relentless innovation and discovery, we are transforming the worlds of televisions, smartphones, personal computers, printers, cameras, home appliances, LTE systems, medical devices, semiconductors and LED solutions. We employ 270,000 people across 79 countries with annual sales of US$187.8 billion. To discover more, please visit www.samsung.com. (c) Mobile Gazette 2012. Simple theme. Powered by Blogger.